The soldiers of World War I are often referred to as the "Lost Generation”; this book is an intimate look at some U.S. soldiers' experiences after being thrust into the centre of the Great War and enduring some of its most gruelling battles. Len Fairfield (the author's grandfather) was an Artillery Scout, or Forward Observer, for the U.S. The soldiers of World War I are often referred to as the "Lost Generation”; this book is an intimate look at some U.S. soldiers' experiences after being thrust into the centre of the Great War and enduring some of its most gruelling battles. Len Fairfield (the author's grandfather) was an Artillery Scout, or Forward Observer, for the U.S. Army, and was a firsthand witness to the war's carnage as he endured its countless hardships, all of which are revealed here in vivid detail. His story takes the reader from a hard life in Chicago, through conscription, rigorous training in America and France, and finally to the battles which have become synonymous with the U.S. effort in France—St. Mihiel and the Argonne Forest, the latter claiming 26,000 American lives, more than any other U.S. battle. Fairfield, with his artillery in support of the 91st ("Wild West”) Division, was on the front lines for it all, amidst a sea of carnage caused by bullets, explosives and gas, with the occasional enemy plane swooping in to add strafing to the chaos. Entire units were decimated before gaining a yard, and then the Doughboys would find German trenches filled with dead to indicate the enemy was suffering equally. The AEF endured a rare close-quarters visit to hell until it was sensed that the Germans were finally giving way, though fighting tooth-and-nail up to the very minute of the Armistice. This is a very well written and readable account of an important but often overlooked aspect of World War. It's an exemplary example of its genre and very highly recommended. All in all, this book is a bit of a gem. It is a well paced easy read and you will find yourself rooting for our hero. I am glad he led a fulfilling and prolific life. Len Fairfield was a top bloke and even from this distance he deserves our thanks.The author has brought him and his era to life and I commend this book to the house. 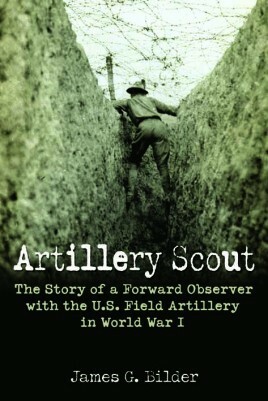 The majority of this book is a lively account of the 58th Field Artillery Brigade"s role in World War I…this role is often overlooked in war literature, so Bilder has found a new element to an incredibly crowded market...This is a fresh, well-researched perspective on a heavily covered subject. There is plenty to interest the military enthusiast, while the emotional angle of Bilder"s grandfather acting as the narrative"s central character works very well.